For a committed Christian, there is no confusion and absolutely no doubt about the certainty of Christ’s Second Coming. In fact, the coming again of Christ is referred to in hundreds of texts throughout the Scriptures. Jesus Himself emphasized the importance of not only working for His glory, but also watching for His coming. He promised in John 14:3 “…I will come again and will take you to Myself, that where I am you may be also.” Jesus always keeps His promises! 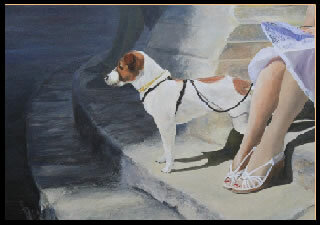 In Kim’s picture she captures the anticipation of a little dog, patiently waiting on the steps, and eagerly watching for the return of its master. What a magnificent portrayal of love, devotion and loyalty. The little dog refuses to be distracted and just keeps watching; patiently waiting for the one it loves! If a dog can demonstrate such affection, then surely greater is the joy, excitement, and anticipation of the Christian who daily watches for the Master’s soon return! The apostle John was very old and ready to die. Since his first encounter with Christ in Galilee many years earlier, he never lost the thrill of watching for the Saviour. In spite of the fact that he was very old, very tired, and ready to die and go to heaven, he expressed the deepest yearning of his heart at the close of the Book of Revelation. In response to Jesus promise, “Surely I am coming quickly“, the watching servant, John, cried out in love for His Master, “Amen, come Lord Jesus” (Rev.22:20). Are you ready for Christ’s imminent return? Are you ready and watching? Have you been born again? Have you the certainty that all your sins are forgiven and cleansed by the blood of Jesus? It is possible to have peace with God. Now! The Bible says, “Seek the Lord while He may be found” (Isa.55:6). If you seek Him you will discover that He is gracious and merciful. Mt. 19:25 asks the question, “Who then can be saved?” Praise God the answer is simple; you can be saved! How? ”Trust in the Lord will all your heart and lean not on your own understanding” (Prov. 3:5). Only those who ‘lean’ on Christ for salvation will be found watching for the Master when He returns in great power and great glory.